The day started early in the morning with a beautiful buffet breakfast as usual. It was an American buffet breakfast filled with favorites like chicken nuggets, poached scrambled eggs and so much more. 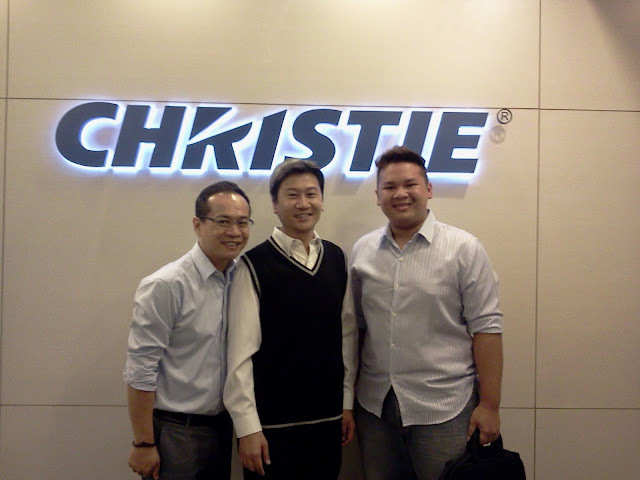 At around 8:30 in the morning, we left Value Hotel and went straight to Christie Technologies Headquarters. The office is about 15 minutes by bus from the Hotel, not too far. Mister Chris and the other officers of the company greeted us. They were all very nice and accommodating as Miss Trina introduced each of them to the group. Just like most Singaporean offices, the people making up the Singapore Headquarters are filled with diverse people from their own expertise, Chinese-Singaporean, Malay-Singaporean and Indian-Singaporean. Despite their differences, you can really feel their good camaraderie and a positive working environment. We were then led to a cinema like room with cinema grade chairs and a big screen! By the material of the screen, you can see that projectors just like those used on classrooms, though on a larger scale, are projecting it upon. They started by briefing us with their products. We were all surprised that Christie projectors and their technology is being used by big companies from around the world for their cinemas and different productions. Even our very own SM Malls uses high grade Christie Projectors. Then the Indian technologist talked us about their latest technology that is being applied in the creation of their massive projectors. It is called the DLP Technology or the Digital Light Processing Technology. Each files like movies, productions, shows are loaded on the projectors which has its own external Hard drive that can hold Gigabytes of files and then being projected. Just like the rule of the white light, as it projects through a prism, the colors are then separated by three primary colors of projector technology, Red, Green and Blue. Each of the colors are represented by DMDs or Digital MicroMirror Device which then projects the images. Each of these devices, about 2x2 inch squares, contains 2.2 million mirrors, which outputs billions of different colors. It really is amazing that such small components bursts out high definition images at a high rate to produce the movies that we enjoy with family and friends. After a few movie trailers and project presentations including the Beijing Summer Olympics, FIFA World Cup in South Africa are just some of their big projects which truly amazed me years ago watching it even in the comforts of my room, we had Japanese food for lunch and we said our goodbyes. 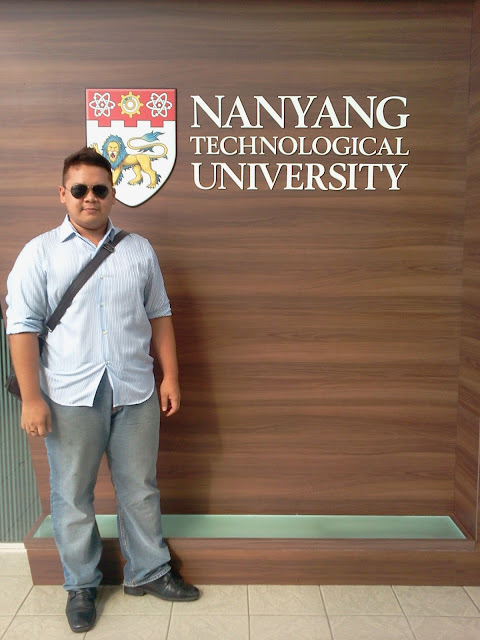 Right after lunch, we then went straight to NTU or Nanyang Technological University. NTU was about an hour drive from Christie Technologies. When we arrive the University it was beautiful! Just like those we see on American Movies and some Asian Dramas. Huge buildings, friendly and smart students and people dedicated in the fields they each chosen. 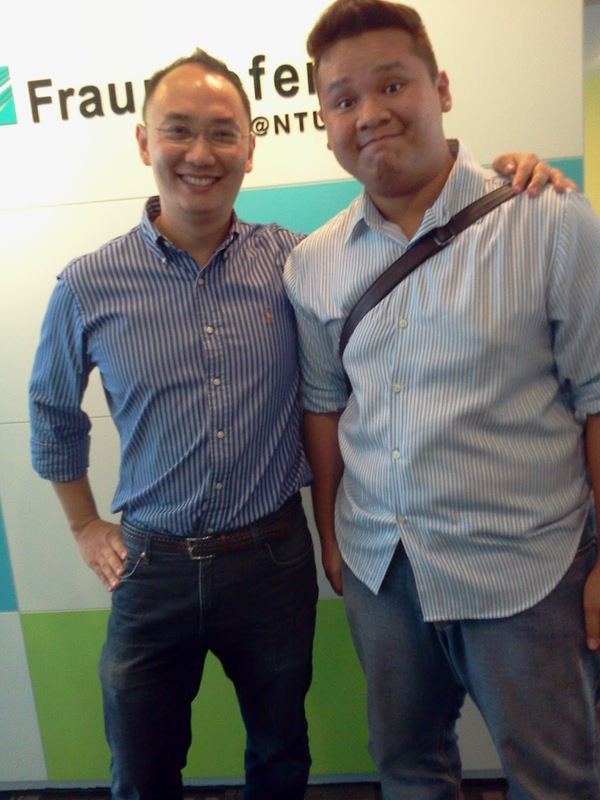 We walked all the way to the building were we are to visit, the Fraunhofer IDM@NTU. The Fraunhofer IDM research centre, according to their profile, carries out applied research. The Centre looks at real world problems and uses technologies in the field of interactive digital media to provide visual solutions. In essence, the Centre looks at user-centered, immersive, real-time visual environments that allow users to interact with information. The Centre also looks at the transfer of this applied research into the industry in terms of computer graphics and interactive digital media, which includes visualizations on large-scale retina, displays as well as mobile devices using intuitive interaction and augmented reality interfaces. Fraunhofer is a German Research Institute that has several research headquarters on key cities around the globe. They have presented us several of their latest research areas in Modern Computer Science and Engineering such as Augmented Reality wherein images and interface objects are merged to real life, real time elements being captured usually by camera hardware. Several examples and exhibits were presented to u by their student researchers which are very accommodating. One of which is a very useful learning material wherein the program is installed on a tablet or a mobile device and with the use of their camera, as they capture and detect the mage on a chart, the description is being shown and even played through audio.. Another research is a game wherein you can play using your concentration. By placing the hardware device on your head, your brain signals controls and commands as on how the character on the game will move, play and even decide. It is also an application of brain transmission and empathic computing wherein your emotions can control something. The day ended with a heat Chinese dinner at Chinatown and after a few hours of roaming around, we then went straight home. The immersion both on Christie technologies and Nanyang Technological University taught us many things in the field of Computer Science and the Modern trends and technologies that are being applied not just for researches but also for use on our future day to day lives. But one important thing that we can all learn from them, especially from Singaporeans is how they manage to work hand in hand despite their obvious differences from their skin color to their diversity of ideas. I think they are bonded by one thing that is their secret to success, their Love for their Country.